Out first stop in the country of Myanmar was the city of Mandalay. When originally planning this part of our trip, we had assumed that we would start in Yangon, but when we found out it was possible to get to Mandalay we figured it would be better to start up top and do a one-way trip down to Yangon. The guidebooks and fellow travelers didn’t rave about Mandalay itself, so we wondered a little bit if it was going to be that much fun to visit. The key to our decision to start in Mandalay was figuring out that there was a cheap flight from Bangkok to Mandalay every day on AirAsia (technically the same airline as the one that just crashed, but there are different subsidiaries in each country and this one on the Thai version). The flight left from Bangkok’s secondary airport, Don Mueang, which we had to take a taxi to get to. The flight itself was delayed for an hour because of a military airshow, so we were there in plenty of time and were able to enjoy a bowl of noodles at the gate. The Mandalay airport itself was a bit small but getting in and getting our bags went smoothly. It is located 45 minutes outside of the city, but AirAsia provides a free shuttle to the city center. We caught the shuttle and then at the dropoff point were able to get a taxi to our guesthouse. We can’t rave enough about the Yoe Yoe Lay Guesthouse. If you are going to Mandalay, you should stay there, no question. The level of service is amazing: everything is done with a smile, the provided breakfast is large and you have to fight to keep from getting extras and the facilities are nice, clean and commodious. The owner, who everyone calls “Mama,” is amazingly kind and generous, and will go out of her way to make you feel at home. Also, this place seems to attract a nice crowd of like-minded travelers, and we made a lot of fun connections just hanging out in the common area each night. Yoe Yoe Lay set a very high bar for the level of accommodations we are going to expect in Myanmar. We ended up staying at Yoe Yoe Lay for four nights, and in three separate private rooms. We only booked two nights in advance since we weren’t sure we would like Mandalay, but almost immediately we decided we wanted one more. But by the time we asked them, our room was already spoken for, so we had to switch to a different room. The new one had a private bathroom instead of using the shared facilities, so it wasn’t too much of a sacrifice. We also stayed one more night in a different room after spending two nights in the nearby town of Pyin Oo Lwin (separate blog post coming soon). The taxi driver who took us to the Guesthouse on the first day also told us that he would offer his services for the day to drive us around to sights in the three “ancient cities” near Mandalay: Amarapura, Sagaing and Inwa. All three were the capital of a kingdom at some point in history and have remnants left over from their glory days in addition to active Buddhist sites. The cost for the day was $35, which our host told us was reasonable, so we decided to accept. The day started out bright and early with our driver picking us up at 8:00 AM. Our first stop was actually within the city of Mandalay: the Mahamuni Paya, the main Buddhist temple in the city. He dropped us off at one of the lesser-used entrances. We put our shoes in lockers (everyone must be barefoot within the sacred area) and walked into the complex. The main attraction is a 13-foot tall seated Buddha, made of gold and believed to be 2000 years old. Male worshippers may approach this image and apply gold leaf, but women have to sit outside or watch on one of the TV monitors. There were quite a few people visiting this image on the day we were there. In the buildings surrounding the courtyard, we also went through a gallery of paintings describing how the Buddha was moved to Mandalay and a room with some bronze figures from Angkor Wat. The next stop on our tour was at a shop that did traditional wood carving. It was pretty interesting to watch the male workers chisel away at the pieces of teak wood. We were tempted by a smaller piece but didn’t want to have to figure out how to get it home. Inside there were some ladies working on pieces of embroidery. We did buy a smaller piece of this which had an owl on it. We then headed onto Amarpura and into the Maha Ganayon Kyuang Monastery there. Our driver instructed us on where to stand to watch them get their lunch at 10:25. We had a little bit of time before to wander around the grounds. We made it back to the spot by the road in time for them to line up. Unfortunately, there were a ton of other tourists there, so it was kind of a strange experience, with everyone snapping pictures of all of the monks as they stood in line. It was interesting to watch the process of how they got their food: volunteers were standing just outside the dining hall, and the monks would file past and get a large serving of rice, some cake and a drink. We got back in the car and drove on south. We paused before crossing the big Ayerarwady River on the new bridge to take in the sight of the river and our next destination: Sagaing Hill. We could see the large hill with many sparkling pagodas covering it. This was the site of a capital of a Shan kingdom in the 14th century but now is mainly known as a big site for monasteries and temples. We were dropped off at the base of the hill and shown the path to take to get to the top, through One Lion Gate. The path up took a while – Lonely Planet says it was 350 steps. Once we reached the top, we took off our shoes and explored the Pon Nya Shin Pya, with its shiny gold stupa and a big Buddha image. The platform surrounding gave nice views of the surrounding area. We stopped and sat for a while just to relax. We headed back down the stairs and found our driver. We drove back over the river on the old bridge (much smaller) and went to the dock to head to the dock for Inwa. We found out that the driver doesn’t actually take you there – you have to take a boat across. Inwa has been the site of a royal capital four different times from 1364 to 1841. There are a few ruins and old temples spread about. The way they expect you to see the sites is by horse cart. We weren’t sure we wanted to pay for this, so we started walking past them, declining numerous offers. We had just turned the corner when we gave in to one persistent driver and took the cart. This caused some sort of argument between him and other drivers, which left us feeling a bit awkward. The ride in the cart down the narrow dirt/sand paths was fun but quite bumpy. After a little while we were dropped off at our first stop, Maha Aungmye Bonzan, also called the “Brick Monastery” since it was built from brick covered in stucco (in 1822). It felt quite older than the other temples that we had thus far seen. There weren’t a lot of other people around. As we were first circling, a teenage boy came up and started talking with us in English. We think he just wanted to practice, because he never asked for anything. We had to pause where a Burmese family basically insisted that we take a picture with their infant. Della held it while the rest of the family tried to make the baby look at them. We then took off our shoes and entered inside the upper level, still accompanied by our conversation friend. He followed us until we left to head back out to the horse cart. 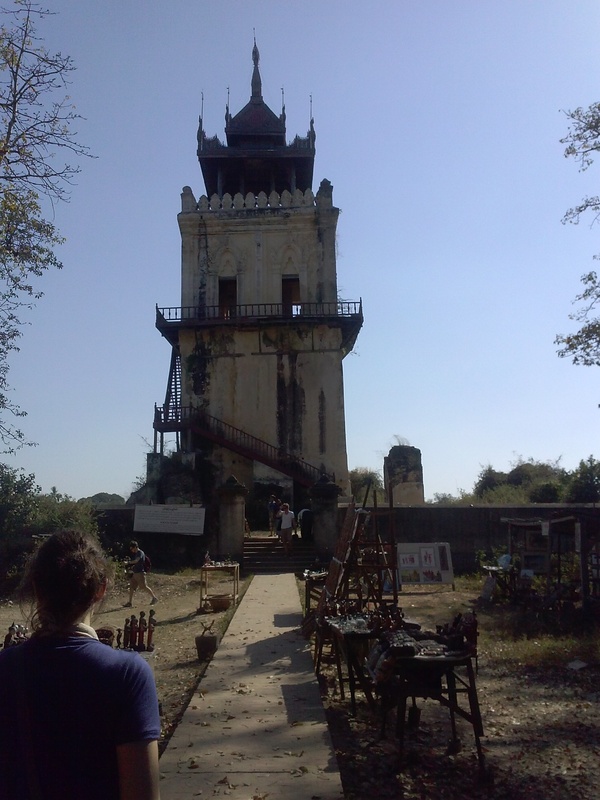 We then stopped at Nanmyin, the “leaning tower of Inwa”. This was a watchtower for the palace of King Bagyidaw. The staircase to go up into the tower was closed for safety reasons so we just briefly walked around one side of it. Back on the cart, our driver cut through a banana field and took us to the Bagaya Monastery. This temple is built out of dark teak wood, and definitely had a different feel to it. This was probably our favorite of the different things we saw in Inwa. It was also the most crowded with tourists. We took our time strolling around the buildings, making sure not to damage our bare foot with any nails. Our final stop was a small complex called the Yadana Sinme Pagoda. The highlight of this area was the ruins of an old chamber (with columns arranged like a Christian church) with three Buddha statues at one end. Our horse cart driver then returned us back to the dock. We hopped right on a boat and returned to the other side where our driver was waiting. He drove us back to Amarapura, this time to the U-Bein Bridge. This famous bridge is made out of teak wood and is over 1 km long, making it the longest teak bridge in the world. It also seems to be quite a popular destination in the evening, with many people strolling back and forth over it. We walked all the way over to the other end of it, then returned to about halfway and waited for the sunset. Eric went down off the bridge briefly to snap some pictures of the bridge from below on an island. As it got dark we returned to our accommodations, arriving at about 6:30 PM. Quite a long day of sightseeing! The next day we decided to stick to sightseeing within the city limits. 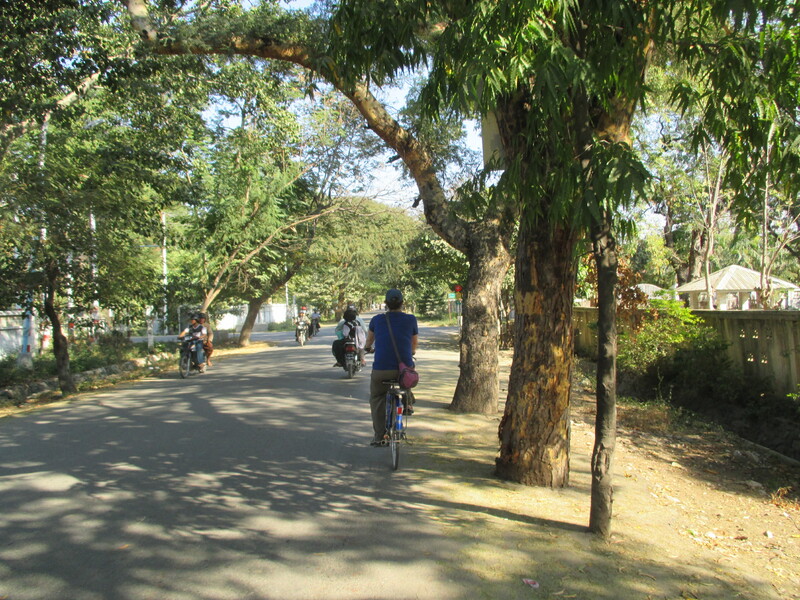 We rented bikes from the guesthouse and braved the Mandalay traffic (just stick your nose out there and people generally give you a wide berth), heading in the general direction of Mandalay Hill. We rode past the large fortress walls and moat but did not go inside. This was one of the quitter streets we rode on. Otherwise we couldn’t have taken this picture! Our first stop was the serene Sandamuni Paya, which contains rows upon rows of white stupas (1774 to be exact), each of which holds a marble slab inscribed with a page of writings from one of the teachings of Buddha. There were few people here, and we enjoyed relaxing and listening to the tinkling of the bells attached to the tops of the stupas. While we were wandering, a monk approached us and struck up a conversation in order to practice his English. He directed us towards the nearby Kuthodaw Paya, which has 729 inscribed marble slabs of its own. Its temple complex was more brightly colored that Sandamuni, and there were many more people visiting, so we didn’t prefer it quite as much. We rode to the base of Mandalay Hill, parking our bikes in a dedicated area next to the entrance with two big stone lions. We knew this would be a long hike up, so we were sad to see that we had to take our shoes off at the base! Reluctantly we followed the rules and started hiking up the hard concrete barefoot. After long flights of stairs, we went through a few different small pagodas and one with a large statue. We made it to a landing with a pagoda with a large golden Buddha pointing back at the city. We thought this must be the top so we stopped and gulped some water. But then we walked around the back and saw the stairs continued upwards. We kept going, and realized that it seemed like it would never end. We passed more small pagodas, a really steep staircase that led to what felt like an abandoned warehouse, and a flashy temple with a Buddha footprint. Then, we finally reached the top! We walked around the outside railing, enjoying the views in all directions of the area below. We also sat own and rested our aching bare feet. But we knew we couldn’t pause for too long since it was almost 4:30, and we didn’t want to be riding bikes home too long after the sun set at 5:30. We started back down the hill at 4:50. Our feet were really killing us but we pushed on as fast as we could. It took us about 20 minutes to get down. We hopped back on our bikes and rode home as fast as we could, making it back just as it started to get dark. 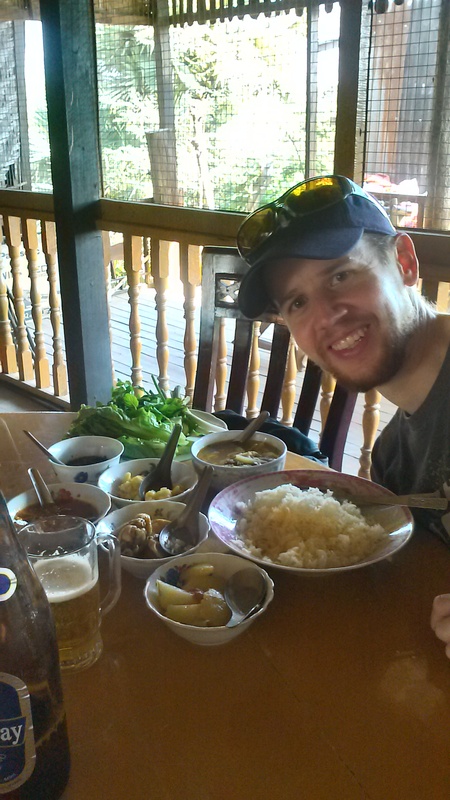 We had heard that Myanmar food left something to be desired, so we weren’t quite sure what to expect. As it turns out, we were pleasantly surprised by the meals we received. 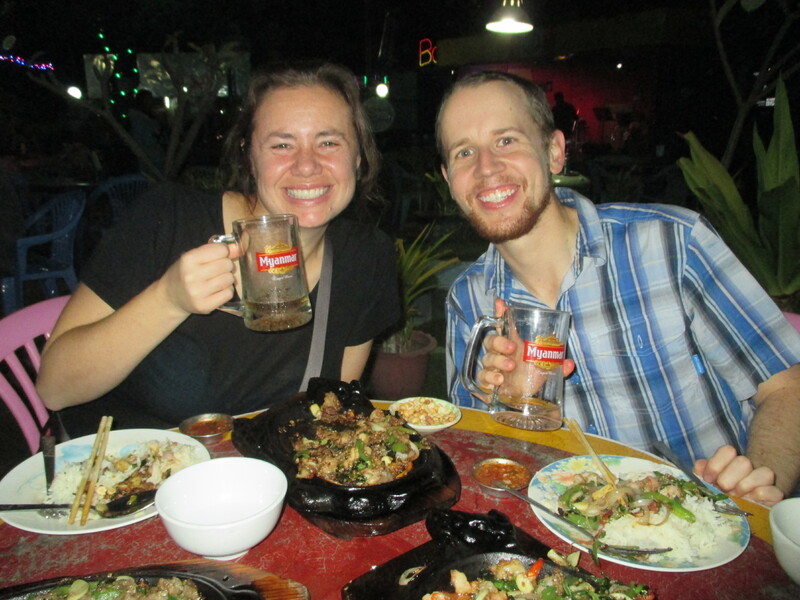 Our first night in Mandalay, we headed with some fellow travelers to Win-Win 35, a restaurant/beer station/live music venue within walking distance of Yoe Yoe Lay. Each of us got a variation of an “iron plate”, which turned out to be an iron skillet with a meat of choice sizzling on top (kind of like fajitas). It was very tasty and filling – we probably could have shared one between the two of us. 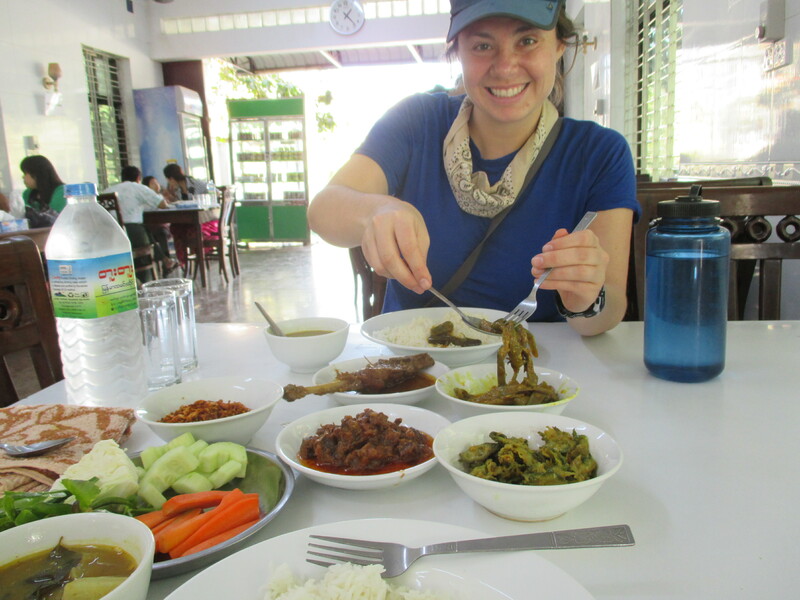 On our Ancient Cities day trip, our driver directed us for lunch to a restaurant near the Inwa ferry landing. It felt pretty touristy but was a nice introduction to some of the traditional dishes. Della tried some of the fried noodles, which she enjoyed. Eric ordered a chicken curry, in which the meat itself was definitely mildly spiced, but the best part was that curries traditionally come with multiple side dishes, including a sour vegetable soup, noodles, and a few different sauces plus vegetables for dipping. The day we rode our bikes to Mandalay Hill, we stopped for lunch at Too Too Restaurant downtown, recommended by both our guesthouse and Lonely Planet. Here we each picked a curry from a selection of trays near the front. We enjoyed eating our selected meat with the similar spread of all-you-can-eat side dishes and rice. 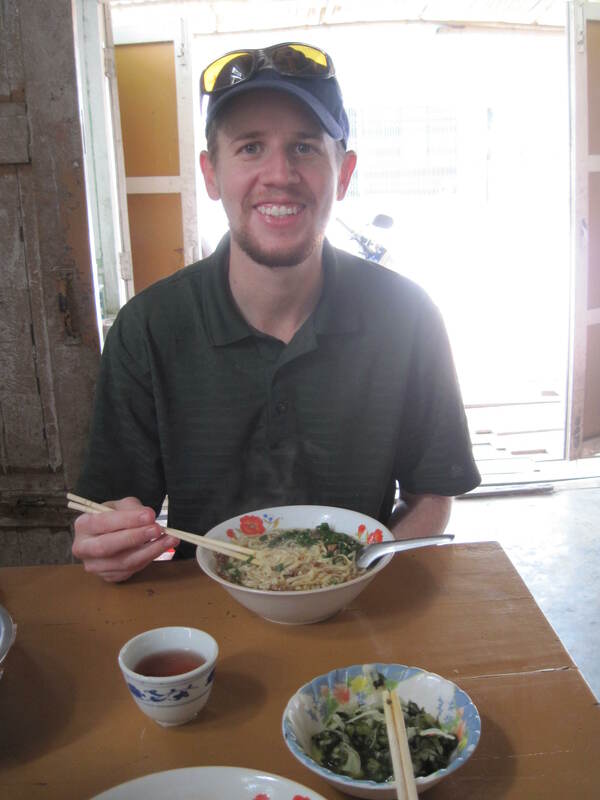 The day we returned from Pyin Oo Lwin, we ate lunch at a simple noodle house next door to Yoe Yoe Lay. We thought our noodles were great, but that may have been because “Mama” came over and made sure the cooks knew not to make them too oily (a common complaint from tourists)! As it turns out, we are really glad that we started our trip in Mandalay. We enjoyed the sites that we saw, and we got to experience a great guesthouse. If this is a destination that some people think is skippable, we can’t wait to see what the rest of Myanmar has in store for us! Wow again. That was a long and very excited post that makes us want to return. And it did not even include unnecessary jelfies. I am so glad you are enjoying Burma and the food and guest houses. We have to put it on our revisit list. I take it the prices are attractive as well. we have several times seen the same reactions to the one (horse) driver winning out. The others are made or accuse him of cutting a deal or just wondering how you persuaded you to go with him when they all failed.